On a recent trip back to the east coast (rural upstate New York and New Hampshire), I quickly learned not to order the dishes I was used to eating, as restaurants there may have menus that *sound* good, but they really, really fail to deliver at the level of even a mediocre restaurant here. I was foolish enough to even try the foie gras at the only restaurant within a 2 hour drive of my parent's house that serves it. But I digress. One thing that I didn't have, but really wanted to, was a lobster roll. There I was, just an hour from the Maine coast, and I didn't have one! I've been craving one ever since. So when the long holiday weekend rolled around, and I had the chance to visit places that are only open during the week for lunch, one place immediately rose to the top of my list: New England Lobster. Now, I just got done talking about how the right thing to do is embrace local cuisine! When in New England, get the lobster. When in California, get the produce, get the local seafood, etc. Right? And, I've pretty much universally been disappointed with all lobster I've had in California. But ... this place had great reviews. And even though it was located way out of the way in South San Francisco, I still thought it was worth a try. Why? They are primarily a lobster wholesaler and have been in business for 25 years. They also have a storefront selling live lobsters and crabs, fresh lobster and crab meat, frozen lobster tails, shrimp, scallops, and some other seafood. But first and foremost, their business is fresh, live lobster. And a few months ago they opened a lunch trailer, parked outside in the parking lot. The trailer serves exactly three items: lobster roll, crab sando, and lobster and corn chowder. The incredibly limited menu also made me hopeful - they weren't wasting time with any superflous dishes! Everything is served to go, although there are a few picnic tables and a counter with some bar stools to sit at. On the day we were there, it was insanely windy and everyone was eating in their cars. Service was pretty fast, and we quickly received our goodies in styrofoam containers. Since there were two of us, we decided to get one of each sandwich, and split them. We were craving the lobster rolls, but given that the crab was fresh local dungeness, how could we NOT try that one too to compare? The seafood salad in both sandwiches consists of just the meat, a little bit of mayonaise, and salt and pepper. Nothing more. No fillers. Just high quality, fresh seafood, being allowed to shine. On the side of the truck is a condiments station, so you can dress up your sandwich as you please. If you want to add some crunchy fresh vegetables, it includes cubes of celery, onion, and jalapeño. And some horseradish spread, old bay seasoning, Hellman's mayo, and hot sauce. The food was quite good, and I'd return if I was ever craving either of these dishes again. And I'd definitely like to try out the chowder too. And if I ever want to just pick up some live lobster or crab, or some fresh crab or lobster meat, or some frozen seafood, I'd certainly consider going there. They clearly deal with quality, fresh, product. 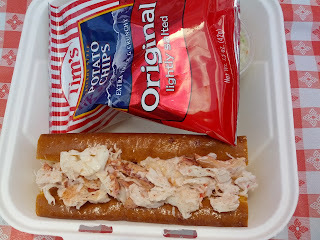 Lobster roll, traditional New England split-top roll. $15.50. 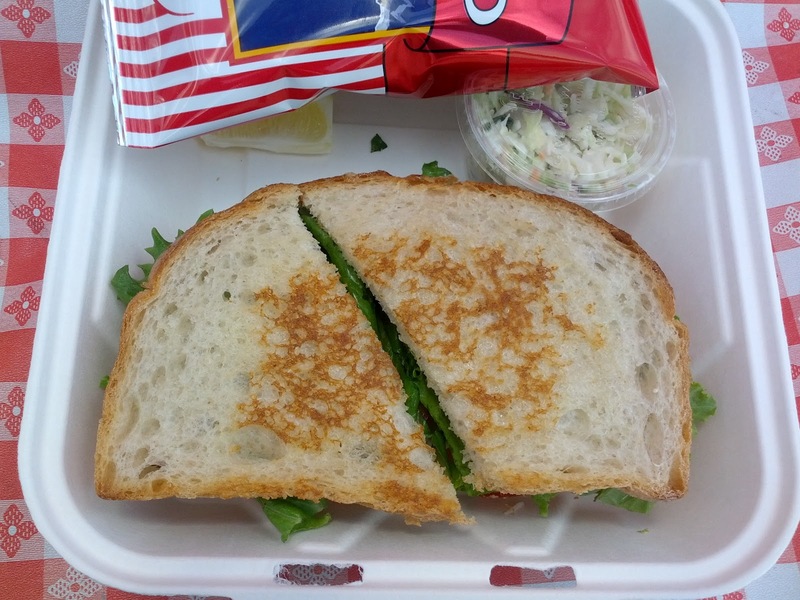 Each sandwich comes with a bag of potato chips, a wedge of lemon, and small container of coleslaw. The chips were generic Tim's plain potato chips. I kinda wish they would include some classic new england chips, like Cape Cod kettle chips! Or something more notable. But, we weren't there for the chips. The coleslaw was also fairly forgettable, not all that fresh and crunchy, not all that flavorful. It did have nice plump raisins in it. The filling was a cold lobster salad, with a generous amount of lobster meat, large chunks, very lightly dressed. It was fresh, tasty, and definitely the best lobster I've had in California. I did find three pieces of shell in my half however, one of which I actually choked on. I added celery, onions, and jalapeño to mine, and appreciated the crunch they added. As a whole I preferred this sandwich to the crab sandwich, although I liked the crab salad more than the lobster salad. $15.50 is a little pricy for a sandwich, but seems pretty reasonable for the amount of lobster meat included here. Crab Sandwich, San Francisco sliced sourdough, lettuce, tomato. $14. The crab sandwich also came with chips, slaw, and lemon wedge. The lemon went very well with the crab meat. The sandwich included a fairly generic piece of lettuce and very out of season tomato slices. We both quickly removed the tomato. I'm sure that nicer tomato would have gone well in the sandwich, but this was just mush and seeds. The bread was unfortunately sourdough. Sigh. My life would be easier here if I liked sourdough. But I really, really don't like it. The bread seemed high quality, and my dining companion really liked it, but it really ruined the sandwich for me. It was oiled up and toasted, definitely more oily than I'd like, but not as much as the lobster roll. However, it worked much better with the lobster than it did here, the oil overpowering the more delicate crab. The crab salad was also served cold, and like the lobster salad, it was just lightly dressed with a little mayo, salt, pepper. The crab meat was all shredded, no chunks. There was a TON of crab meat in here. I wish I had taken a picture from a better angle so you could see the quantity, it was pretty impressive. I added some of the horseradish spread to my sandwich, and thought it paired fantastically. $14 is again a little pricy for a sandwich served out of a truck, but there was an insane amount of crab in here. Menu for the evening ... soo exciting sounding! When they released the menu, I grew even more excited. This one was going to be even more special, with 7 courses instead of 5 like the last few. 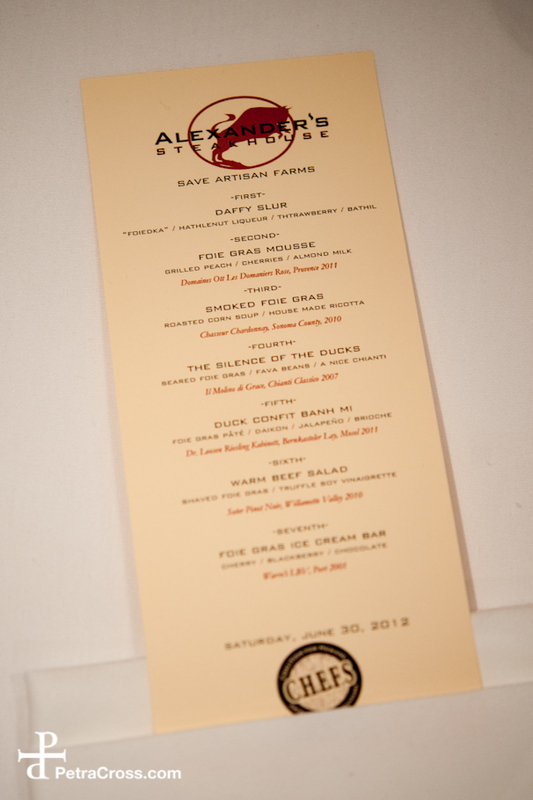 The variety of foie preparations listed was astounding: liquid, mousse, smoked, pâté, seared, shaved, frozen. Drink pairings were equally varied, starting with a cocktail, ending with a port, and hitting a rose, and some reds and whites (even going back and forth!) along the way. The menu seemed all over the place, with a soup, a salad, and a banh mi, in addition to some more classic sounding foie dishes. And shockingly, there was not a steak as the main course. I was intrigued! The menu was $185, including drink pairings. While Txoko's $100 4 course foie dinner still wins on best value for price, this was a very good price, as there was more foie and the food was far better prepared than the similar style $210 Michael Mina 7 course foie dinner, the $195 Fifth Floor 5 course foie dinner, or the $183 4 course Village Pub foie dinner. Alexander's wins again, no question. Chef Marc Zimmerman welcomes everyone. To begin the night, Chef Zimmerman welcomed us all, talked about the upcoming foie ban, and about what C.H.E.F.S. is doing to fight the ban (proceeds from the night go to C.H.E.F.S.). If you haven't done so already, please go sign the petition to end the ban! Serving a big group like this at once can be quite difficult, and we've seen it be a little problematic at past events, however, this night, everything went off without a hitch. Service was spot on. It felt slightly more casual than normal service upstairs, with tables being served all at once, but not in the totally carefully orchestrated way they are in the main dining room. Servers immediately explained all of the dishes once we had all received them. Water glasses were kept filled, places were cleared soon after finishing, new utensils promptly brought to replace them, etc. Staff were friendly and enthusiastic. Pacing of the meal was perfect, with enough time to finish all of the wine and enjoy a small pause between dishes, but never too long. The food was fantastic. I think the chef made some very wise decisions on the dishes to serve that night, as, besides the seared preparation (which is a classic and he just had to include), none of the dishes required being served piping hot or immediately, which I think made it much easier to handle preparing for so many diners at once. Ranking the dishes at the end of the night was incredibly difficult, as I genuinely enjoyed each and every one. It is incredibly rare to have so many courses be consistent home runs! The wines were equally great, I'd gladly order any of them again. Again, rare to have every single one be something I really liked! Everything about the night was near perfection, from the amazing food, to the comfortable, welcoming environment. This was an incredibly memorable night, and I wish I could re-create it again. Perhaps we'll get a chance to have a first post-ban-appeal dinner? Fingers crossed! Bar manager Casper Rice shakes up the starting course: a cocktail! To start off the night, Casper swung into action preparing the first "course", a foie gras cocktail! I wasn't sure what to expect, as the Celebration of Foie Gras dinner at Fifth Floor also began with a foie-inspired cocktail, but that one only had some foie powder on the rim. But Casper had been telling us about this drink for the past few weeks, and it sounded like he was building quite a masterpiece. Casper had quite the operation set up, quickly producing cocktails for the full room. And a masterpiece it was. A lot of work went into this drink! To start with, he prepared the "foiedka", that is, Kettle One infused by soaking a seared lobe of foie in it overnight. Then, he created the hazelnut liquor, starting with roasting his own whole hazelnuts. And then of course he made the strawberry gastrique that morning, starting with fresh strawberries that he diligently chopped and reduced down with some white wine. Now it was time to mix it all together, shake it up, top it off with some prosecco, add a skewered fresh strawberry ... and viola, the "Daffy Slur"! This drink was absolutely amazing. It really was a fantastic foie gras dish in liquid form. I never imagined it was possible for it to be this successful. Upon taking his first few sips, Emil got perhaps the biggest grin I've ever seen on his face. He was downright giddy as he exclaimed, "That is like liquid foie!" The foie flavor was incredibly strong, it really, really came through in the drink, both in the initial sip and in the finish. But then it was balanced out by the strawberry, also incredibly flavorful. How he got both foie and strawberries to be that flavorful as liquids, I have no idea! The use of fresh ingredients clearly made it really shine. It was sweet, but not too sweet. The strawberry and foie were a perfect pairing. It was just really, really good. When they came to ask if anyone wanted more, absolutely everyone said yes, even though we knew that we had 6 glasses of wine coming up. It was too good to resist. It was also shocking, since we had a variety of palates at the table, some hating sweets, some only liking sweet cocktails, some not even really liking foie ... and absolutely everyone loved this drink. Amuse bouche: tartelette with foie gras mousse, brûléed fig. We started with an amuse bouche, which of course featured foie gras. It was a little tart shell, filled with foie gras mousse, fig compote, and topped with a slice of brûléed fig. The tart shell was fairly generic, but savory rather than sweet. The mousse was excellent, very creamy, with a strong foie gras flavor. 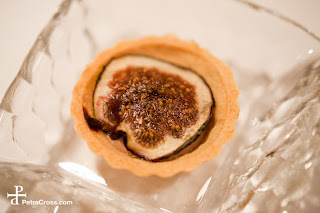 The fig compote and fig added a nice contrasting sweetness. Overall it was tasty, but fairly unremarkable. Last pick of the night for those who rated it. 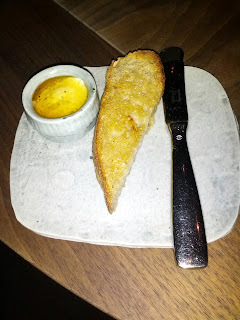 After the amuse, we moved straight into the first appetizer course, skipping bread service completely. I didn't mind, as I had no intention of filling up on bread rather than foie, but the past events did all include bread. It seemed like perhaps an oversight? Foie gras mousse: grilled peach / cherries / almond milk. While those dishes were good, this one blew them out of the water. The mousse, while it looked the same as the previous night, was nothing like it. Both were served as little half spheres, but this one was just insanely creamy and fluffy, probably the best foie mousse I have ever had. Topped with some crumbled marcona almonds that added a great contrasting crunch. Also on the plate was some dots of sweet peach puree and a peach marshmallow, that like the previous night, was sweet and had a great peach flavor. And as with the previous night's dish, I loved the pairing of peach and foie. There was also a cherry that had been pitted (although the stem was still on, so this took me by surprise! ), and macerated in ume wine, giving an additional choice of sweet stone fruit to pair with the foie. And two small toasted brioche crackers, which added another crunchy aspect to the dish. The foam was an almond milk, which didn't taste particularly almond-y, but added another interesting texture to the dish. Finally, there was a little bit of basil oil to add another savory component. The dish came together well, with good flavors and nice contrasting textures. It was the best foie mousse dish I've ever had. The top pick of the evening for 4 of us, but 5th and 6th for two others. As we were all almost finished with the dish, one diner exclaimed, "you know it is good when you forget to drink your wine!" Looking around, I realized that several of us had neglected our drinks, a very good sign indeed! It was paired with a rose, Domaines Ott Les Domaniers, Provence 2011. It was slightly sweet, but fairly dry. Smoked foie gras, roasted corn, house made ricotta. Before the soup is added. Next we were presented with a slightly unappealing looking bowl. 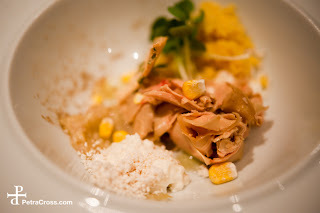 Inside of it was a hodgepodge of elements: smoked foie gras, kernels of roasted corn, freeze dried corn, brown butter powder, ricotta, confit leek jam, and corn tomalito. I didn't really care how it looked, corn season just started, and I've been really enjoying corn for the past week or so, particularly roasted corn. And what better to add to corn soup than smoked foie? This was the dish I was second most excited for! Pouring in the roasted corn puree. Servers came around and poured in the roasted corn puree, tableside. This dish reminded me of one prepared by Chef Joey Elenterio at the last Alexander's foie dinner, as it also was a dish of shaved, smoked foie gras, with a seasonal soup poured in tableside. While I liked that one for its creativity, I didn't think the dish worked very well. This was another story. It was delicious, an amazing mix of flavors and textures. The puree was piping hot, causing the ricotta and brown butter powder to fully melt into it. The cold shaved foie gras also somewhat melted in as well, just enough to infuse the soup with flavor, but still leaving behind some pieces to enjoy by the spoonful for more intensely foie flavored bites. And those were some phenomenal bites, as the foie had an amazing smokiness to it, was creamy, and delicious. The whole kernels of corn were a nice touch for adding additional texture to the dish. 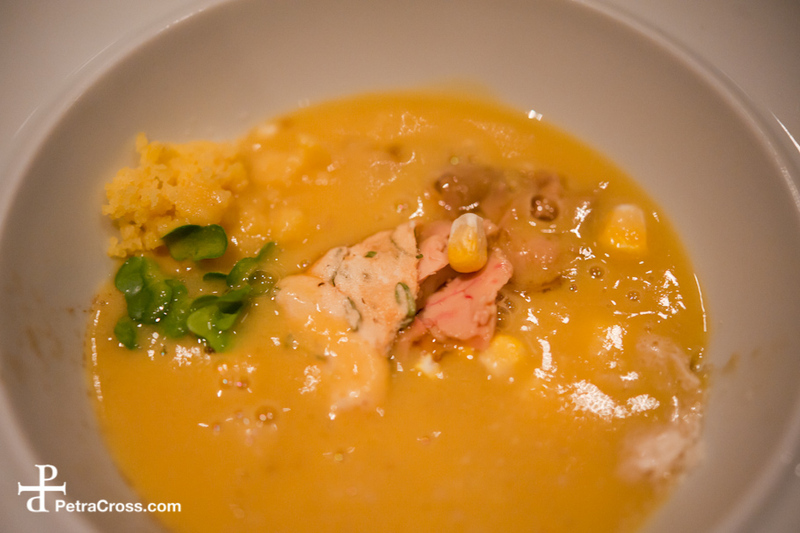 The corn tomalito was another great element, reminding me of cornbread. Overall, this was just fantastic. So much flavor from the roasted corn and the smoky foie, which paired together very well. So many fun textures, with the ability to swirl things together to make perfect spoonfuls. This dish clearly had a lot of thought put into it in order to achieve this final perfection. The temperature of the corn puree was essential, as was the thin shaving of the foie, and the fact that the brown butter came as a powder, rather than a liquid. Very creative, and it tasted fantastic. I was very sad when this dish ran out! Both Emil and my second pick of the night, 3rd for another, 4th for another, and 5th for the other. It came paired with a chardonnay, Chasseur, Sonoma County, 2010. I really liked this, it was really buttery, and went absolutely perfectly with the soup. "The silence of the ducks": seared foie gras / fava beans / a nice chianti. I almost jumped out of my chair when I saw this approaching. I may or may not have shrieked "OMG! Look at the crust on that thing!" Such an outburst may or may not have been partially influenced by the multiple Daffy Slurs and the amazing wines thus far. But seriously, look at how well seared this was! I'd been looking forward to this dish as well, since I know Alexander's can do a great seared foie. I've been rather grumpy at most seared foie I've had lately, with my number one criticism, besides it being served cold, being that it just doesn't have the level of sear that I want, not enough crust on it. While this was unfortunately not served hot enough, it did have perhaps the best sear I've ever had. Just perfect, resulting in a strong caramelization. I know it is hard to serve a large group (~50 diners) perfectly hot food, but I really wish they'd been able to get the temperature better on it. Also on the plate were a few whole fava beans and a bit of fava bean puree. Some people at our table really loved the fava beans. I thought they were well cooked, but I was far too distracted by the incredible foie to really notice them. There was also a cinnamon thyme cracker, which I didn't really know what to do with, as it wasn't quite strong enough to support loading it up with a piece of the foie. The dish was thrown over the top by a plentiful pile of crispy shallots. Amusingly, every single foie dinner we have attended has included crispy shallots, and like those, I found them just amazingly tasty. I was so glad there was a generous amount of these on the plate, as I was able to roll just about every bite of foie in them. The plate was finished with a chianti glaze and duck jus, that added a nice sweetness, and the perfect salt level. This dish was yet another home run. 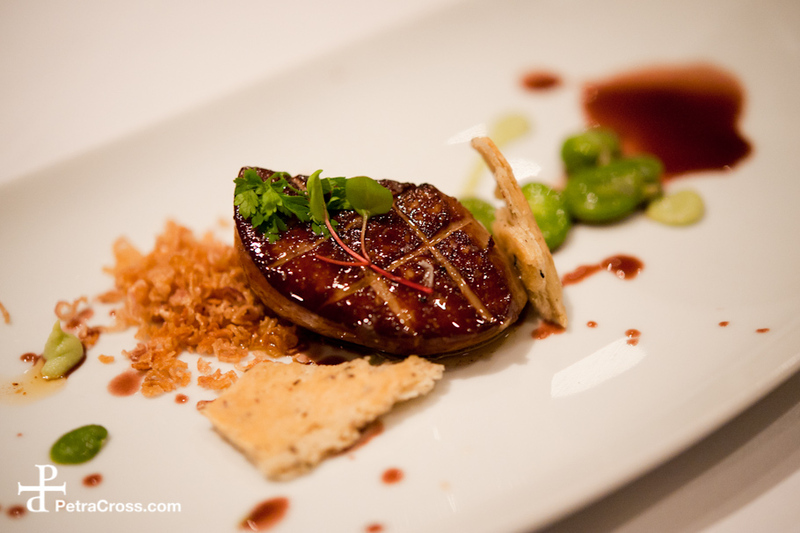 Flawlessly executed seared foie gras, paired with delicious shallots. Had it been served warmer, I can't even imagine how amazing it would have been. It has set the bar for which I will compare all seared foie. Favorite dish of the night for Emil and one other, second pick for two others, and my third. It came paired with a chianti, Il Molino di Grace, Chianti Classico 2007. I also really liked this wine. My tasting notes at this point simply read, "Now, that is a good chianti!" 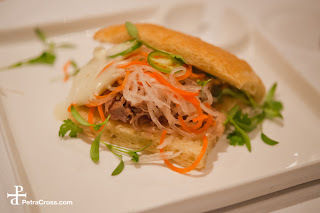 Duck confit bahn mi: foie gras pâté / daikon / jalapeño / brioche. I was finally starting to calm down. The first three courses were the ones I was ridiculously excited for, given the preparation techniques and ingredients (mousse! seared! roasted corn! peaches!). And they had all lived up to, or even exceeded, my expectations. I expected it to be tasty of course, and really liked the creativity of throwing a bahn mi on a tasting menu, but I'm not a huge duck confit nor sandwich fan, so I thought this would be a forgettable dish. Of course it wasn't. I should know better than to doubt Chef Zimmerman at this point. The flavors in this just popped. 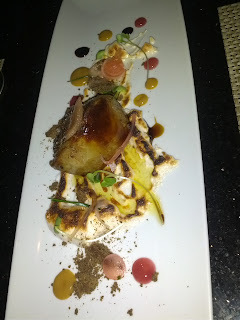 The duck confit was tender and had a fantastic flavor, the best duck confit I've ever had. It was topped with some foie gras pâté, that was kinda lost due to all of the other amazingly complex flavors involved, but I honestly didn't care. I'm sure it added a richness, but this was so good that it didn't even need the foie (yes, I just said that). On top of that was shredded daikon and carrot, which added a great crunch and freshness. And some slices of jalapeño for a nice kick. And dressed with a slather of the tastiest mayo I've ever had: jalapeño duck fat mayo! It added a nice creaminess and additional heat. All served on a delicious buttery brioche bun. This was, by far, the best bahn mi I've ever had. I couldn't believe how flavorful it was, and how perfectly the elements combined, with the chewy but crisp bread, the tender confit, the crunchy vegetables, all in perfect harmony. 4th pick of the night for me, 3rd for 3 others, and 5th for another. It was paired with a riesling, Dr. Loosen Riesling Kabinett, Bernkasteler Lay, Mosel 2001. This surprised us all, as the previous glass was a red wine. 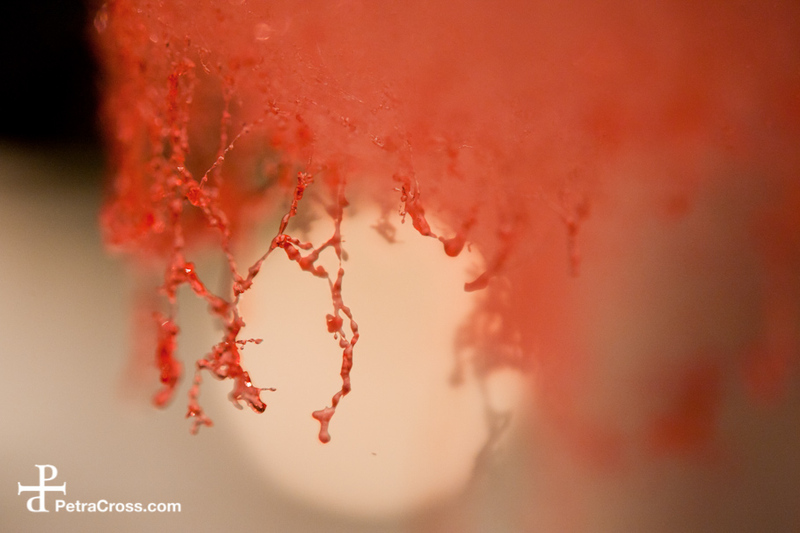 Switching back and forth between reds and whites! The riesling was sweet and I loved it. Intermezzo: sherry gelee, foie gras mousse, passion fruit. To prepare us for the main event, we had a brief break. 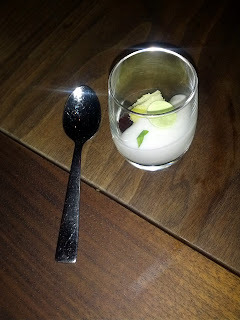 This was rather sweet overload, with both the main sherry sphere and the passion fruit dollop being insanely sweet. The little drops of foie mousse had incredible flavor, and I wish the ratio of this had been reversed: giant foie mousse, tiny little sherry gelees. It was good, but my least favorite of the night. 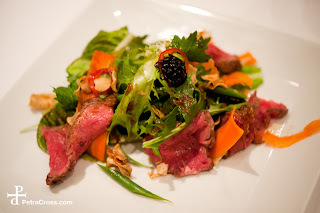 Warm beef salad: truffle soy vinaigrette. Before. Unlike all of the past Alexander's dinners, this one did not feature a steak as the main dish. And it seemed like a strange progression to move to a salad at this point in the meal. But calling this a "salad", doesn't really explain what was headed our way. To start, this lovely salad was placed in front of us. It was made up of assorted mixed greens: frisee, arugula, mitzuna. All very fresh, crispy. Also in the mix was some shaved carrots and snow peas for additional crunch, tiny slices of red fresno peppers for a little kick, and blackberries for some sweetness. 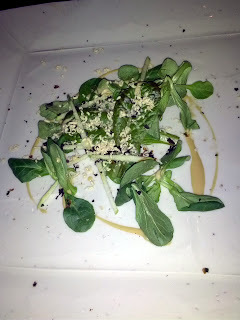 It was lightly dressed with a white truffle soy vinaigrette, sweet, salty, nicely balanced. There were also some delightfully crispy, flavorful pieces of "shallot paper". You know how much I love crispy shallots! The steak slices were from a souz vide cooked Niman Ranch NY Strip, with a nice sear on the edge. As you would expect, they were perfectly medium-rare, incredibly tender, and full of flavor. Our slices weren't actually warm as advertised, but I don't think any of us minded. This was a lovely salad, clearly high quality ingredients, fresh, and nicely balanced. Not something I'd normally order, but I could imagine ordering it sometime if I wanted a nice steak salad. But of course, this was a foie gras dinner. So this is not at all how we ate the salad. Server adding the shaved torchon. 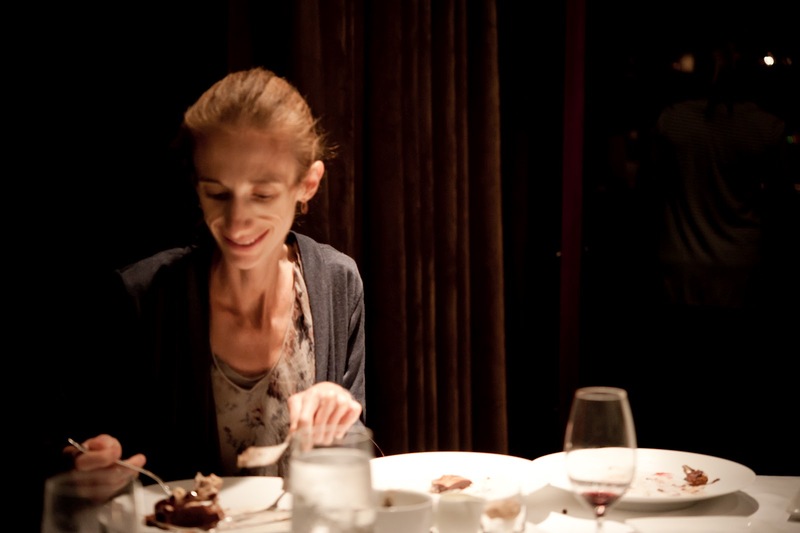 The servers approached with very large pieces of foie gras torchon and microplanes in hand. We had just seen this same move two nights prior at the Michael Mina foie gras dinner, where we also were presented with a salad, and had foie shaved on tableside. At that dinner, we were incredibly disappointed with the amount of foie they added (go look at the photos to see how little foie was added, it was rather remarkable, as there wasn't enough to even taste it). We had a more successful salad with shaved foie on it before that at the Village Pub's foie dinner, but even that one still didn't have tons of foie, and it wasn't done tableside. "Just say when", the server advised. We all kinda looked around nervously at each other. Who, in their right mind, would actually say "when!"? I made a comment about perhaps developing laryngitis around this time. The server just laughed at us, and said he figured that we'd say something like this. And he kept on shaving away. The more polite members of our group did indeed say when to stop, at fairly reasonable times, although, with far, far, more foie than we'd received anywhere else. Someone else just told the server to use his judgement and stop when he felt it was right. I waited until I had quite the mound, and begrudgingly told him he could stop. Warm beef salad: shaved foie gras / truffle soy vinaigrette. After. 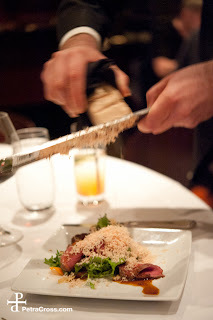 Seriously, look at the giant mound of shaved foie on there! Like the seared dish, this really was a sight to behold. They were incredibly generous with the amount of foie. At one point, one member of our group realized her salad was missing the steak. It took her a while to even realize that, which is rather comical, given that it was a "steak salad"! It was quickly replaced, with freshly shaved foie of course. This was by far the most successful shaved foie on salad preparation that we have had, and not only because it came with so much foie. It had too much stiff competition this night however, making it the 6th choice overall for 3 of us, the 5th for one other, and the second for another. The one diner who didn't give me any other ratings (besides the mousse being his favorite) put this as his last choice, but that is because he can't stand truffle oil. It came paired with a pinot, Soter Pinot Noir, Willamette Valley 2010. I really like pinots, and this one was quite lovely, with a nice complex flavor and not a lot of tannin. It went very well with the steak and the rich foie. This was a winner! Probably the favorite flavor that I've tried. The waiter told us it was "vanilla pink" flavor ... whatever that is :) It was really vanilla-y, and the perfect sweet to prepare us for dessert! I don't have more to say here, I just wanted an excuse to include this lovely shot! Foie gras ice cream bar: cherry / blackberry / chocolate. Oh dessert time! While normally a highlight of my meals, foie based desserts are usually more "interesting" than tasty. And at the past Alexander's foie dinners, the desserts really failed to impress me taste-wise (they were all visually stunning however!). This one however, like the rest of the meal, was a winner. The ice cream on the side was just a simple vanilla ice cream, creamy, and nice to balance out the richness of the rest of the dish. The main component of the dish was the chocolate covered foie gras ice cream bar, with praline mousse. The foie ice cream inside was creamy and had a great foie flavor, one of the most successful foie ice creams that we have had. It went surprisingly well with the chocolate coating. There was also a whole blackberry, some whole hazelnuts, and bits of chocolate wafer. 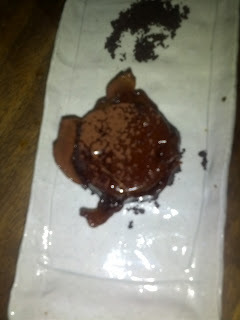 The wafer added a good crunch, and was slightly salty, which complimented both the chocolate and the foie. Even though this was a really good dessert, it was only my 5th pick of the night, 4th for another, and last for the folks who don't like desserts. This is a testament to how strong the other dishes were, as this was definitely the best foie dessert I've had at any of the Alexander's dinners, and edges out the caramel foie ice cream dessert we had at Michael Mina two days prior as the second best foie dessert I've ever had. Fifth Floor's fried rhubarb pie and foie ice cream still wins the best foie dessert award though. And to finish off the night, it was paired with a port, Warre’s LBV, Port 2001. It was sweet, with a lovely caramel aroma. Again, another drink I'd gladly have again, and it went really well with the chocolate and richness from the foie. One basket of goods for the silent auction. This dinner, like the previous ones at Alexander's, included a silent auction, benefiting C.H.E.F.S. 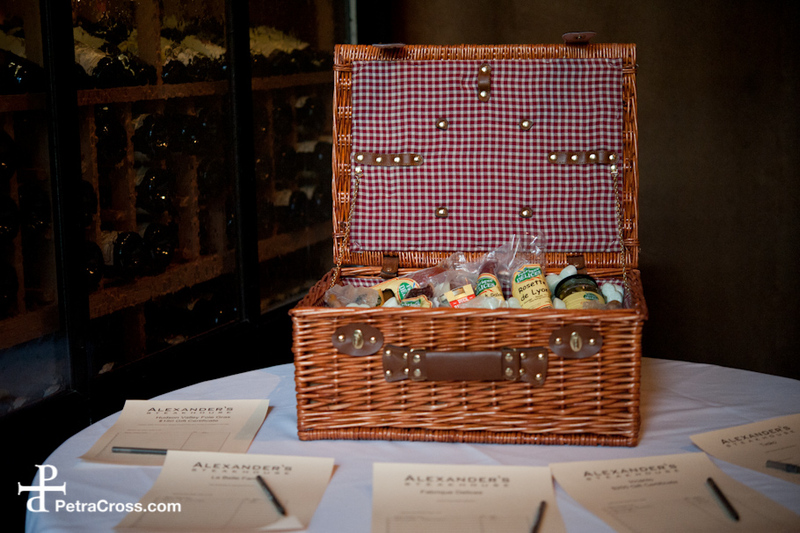 There were a variety of items being auctioned off, including baskets of foie products, dinners, and restaurant gift certificates. After a full week of consuming a rather insane amount of foie gras, and the past month of eating at fairly fancy French/Californian restaurants most nights, I was ready for a break. Casual. Simple. But tasty. And I was really craving something spicy. So, I resumed my quest to find some good Indian food in the city. I still do not have a go to place for Indian. I've had some enjoyable meals at Amber, but after my last visit, I'm in no rush to go back. 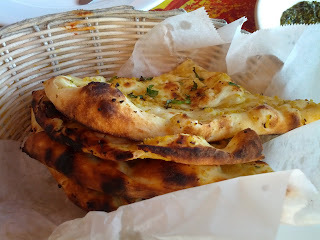 The best I've had lately has been at Amber Dhara, but that is all the way in Palo Alto, and wasn't that memorable. I've asked around, but no one has had particularly strong recommendations either. So I did something foolish: I turned to Yelp. I found a place with a decent number of reviews, 4 stars. Seemed promising. Prices looked higher than a lot of the generic crappy places, which also seemed promising. 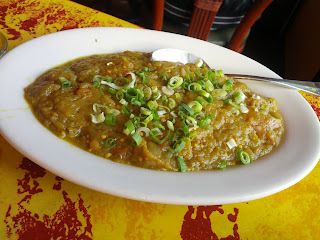 So, I headed to Aslam's Rasoi, in the Mission. Within the same block, we passed several other Indian restaurants (Udupi Palace and DOSA), both full and hoping. When we reached Aslam's Rasoi, it was fairly empty. Not a good sign. Turns out the actual diners know more than the Yelpers. We should have turned away and gone to one of the others at this point. Service was fairly slow, even though there were only two other occupied tables. One of the plates we were given was dirty. As was one of the serving pieces. The food was incredibly lackluster, flavorless, and not well prepared. It reminded me of any generic microwavable frozen indian food from the supermarket. Or a random cafeteria buffet. It was very overpriced. The only real redeeming factor is that the food came very fast once we ordered, and it was served hot. I will not return, and we didn't even bother to take our leftovers home. 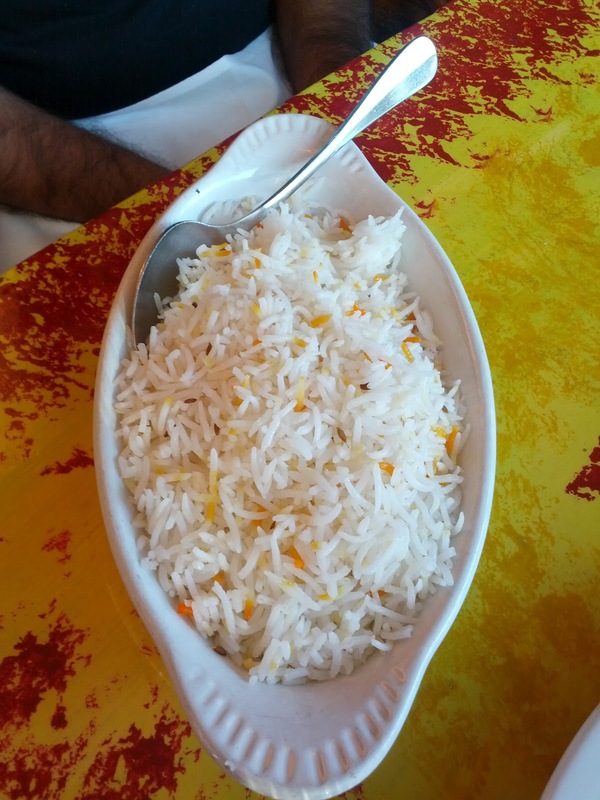 Please help, do you have any recommendations for Indian food in the city, or the Bay Area in general? I'm getting desperate enough to travel for it! Garlic and basil naan: Naan studded with garlic and basil. $3. The only decent dish. Not particularly notable, but fresh, decent char on it, good chew. Lots of minced garlic. It was served in a dirty basket. You can see the random red sauce on the wicker. $3 seems pretty standard for naan these days. Pulou: Basmati rice cooked with saffron, cumin, cardamom and cinnamon. $3. Since everything is served a la carte, rice was an additional $3. Not a lot of rice for the price. Pretty standard, not much to say here. 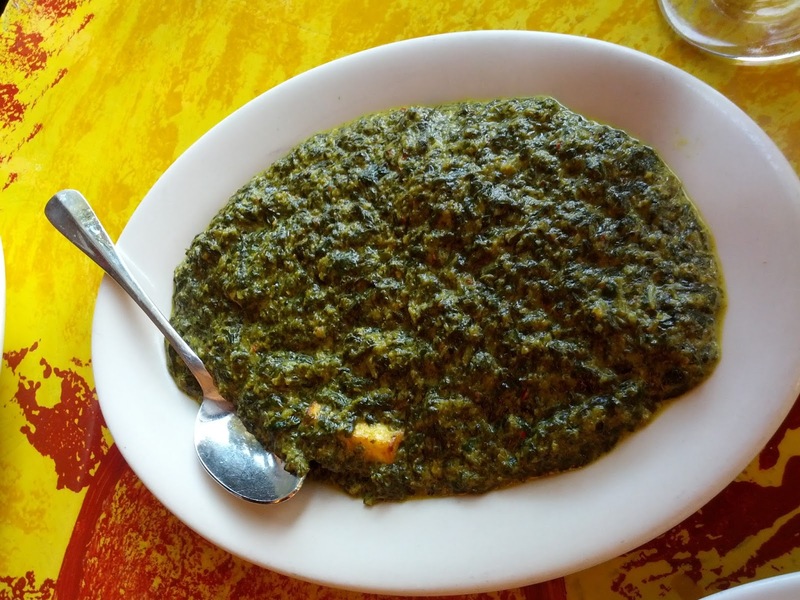 Saag Paneer: Cubes of homemade farmer's cheese sauteed with fresh spinach and spices. $13. I was really excited to have some of their paneer, as it is made in house. I love good paneer. There were only 5 very small pieces of paneer. It wasn't notable, nor well cooked, a little rubbery. The spinach was very finely chopped and just mush. There was no real spicing to the dish. It was however, very creamy. The entire dish seemed about the same calibre as a random version from the freezer section of the supermarket, heated up in a microwave. Really disappointing. No good flavor, no good cooking, too little paneer, and way overpriced at $13. This was as generic and banal as it gets. Bengan Bartha: Freshly roasted eggplant sauteed with chopped onion, garlic, ginger, and spices. $12. Eggplant dishes can be so hit or miss. Too often, they are just mushy, full of seeds, and not very good. But when done well, I love a great eggplant dish, in any cuisine. This, like the saag paneer, was pretty bad. The eggplant was just a pile of mush, the sauce was oily and had no real spicing. Incredibly flavorless. Again, it seemed like something I could have just reheated in a microwave. And again, incredibly overpriced at $12. The final week of foie eating was upon us, and we had some visitors in town who had never had foie gras before. We needed to remedy this. So, weeks ago, I made reservations for Fleur de Lys, as I'd been there once before, but it was part of a big group event, so we weren't able to order the foie dishes, and I'd heard so much about them. This seemed like a great place to introduce our visitors to foie, and for me to get to try a few more final foie dishes! Being a paranoid person, I called the day before just to double check that they were indeed still serving, since I knew a lot of restaurants were running out of inventory. And they delivered a bombshell: no. No more foie. I promptly cancelled my reservation and desperately starting seeking out an alternative. Where could I get a reservation, for a group of 6, the next night, with some awesome foie? I remembered that a friend had recommended Michael Mina, but I had a less than steller experience there on my last visit. Still, I gave them a call to see if they were still serving. Joyful news! Not only were they still serving, they were starting a special 7 course foie menu that very night and not advertising it at all. They described it as all of MM's classic and very best foie preparations. As they read the menu to me, I heard a slew of amazing things: "foie and comte mac and cheese", "seared scallops with foie", "caramel foie ice cream", etc, etc. The menu sounded fantastic. And they could seat us. I put my skepticism from my previous trip aside quickly booked a table. 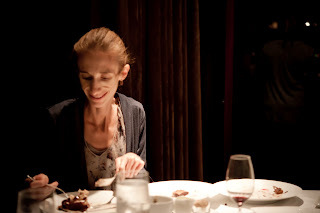 The foie tasting menu menu was 7 courses, for $150, with optional wine pairings for an additional $60. The wines were 2 ounce pours of some really fantastic wines, and that part of the meal was a really great value. I really enjoyed all of the wines. The food however, was much less of a deal. It was 7 courses, but the amount of foie in them was not all that substantial. Like my last visit to Michael Mina, it just seemed overpriced for the quality of food. The menu was creative, yet fairly traditional at the same time, building mostly on classic french sauces and preparations. Not as much molecular work or elaborate plating as many of the similar meals I've been to. I was slightly disappointed by the lack of classic cold preparation on the menu. I thought that a 7 course foie dinner would really let our visitors experience all aspects of foie, to see if they liked it or not, but besides a little mousse in the amuse bouche and a little shaved foie on a salad, they did not get a real taste of a cold preparation. You can read about their like/dislike of the different dishes in the ratings below, as, besides Emil, the two foie-newbies were the only ones to give me their final ratings. The major issue of the night was how inconsistent everything was. This was particularly frustrating because I felt like they were so close to delivering a great experience, but just kept falling short. For example, one person received a near-perfect medium-rare scallop, while mine was well done. Or the chunk of seared foie in one dish had a great sear on it, and another didn't. Some dishes were served hot, some were lukewarm. One dish had a really flavorful puree on it, one had some great sauces, and others were completely tasteless. They clearly had the skill to make it all work sometimes, but just not consistently throughout the evening. While none of the food was bad, there were certainly no wow moments, and nothing stands out in my mind. Service was generally pretty good, with friendly enough waitstaff who seemed knowledgeable about the dishes. There were a few issues however, like never bringing a coffee cup for one person, saying they would find out details on something and not ever coming back, and having two staff members tell us completely different things regarding an ingredient in a dish (details on all of this below). I left the evening fairly disappointed. Overpriced and underwhelmed. At this price point and calibre of restaurant, they really should be able to deliver a more consistent experience, with at least a few memorable dishes. I don't foresee myself going back soon, while nothing was bad, it really didn't seem worth the price. 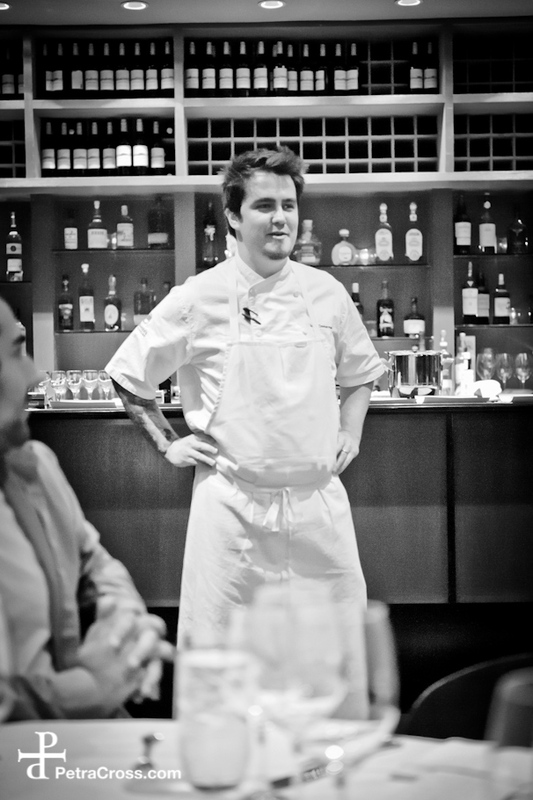 I do still want to check out Michael Mina's other SF establishments sometime, particularly RN74. 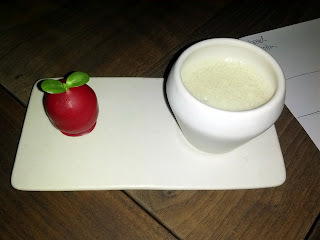 Foie gras 'cherry' and foie gras velouté. Dinner at Michael Mina usually begins with an amuse bouche duo of a soup and a grilled cheese sandwich. Standard diners continued to receive that dish, but as we were doing the foie menu, ours was re-worked to be foie based. The foie gras cherry has been on the menu at MM for the last few months as part of their hors d’oeuvres platter. Inside was a tiny maraschino cherry, covered in a foie gras mousse, with some sort of red coating. And a little leaf added to look like a stem. 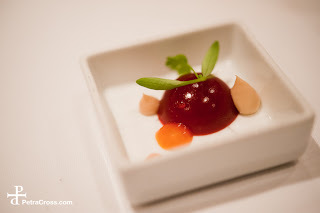 It looked adorable, and I love the pairing of foie and cherry, and I love foie mousses, so I was very excited for it. Unfortunately, it looked and sounded much better than it tasted. The mousse, like so many, didn't have much foie flavor at all. The cherry pairing would be nice, but the cherry was so tiny that it was lost and didn't add much cherry flavor. I have no idea what the coating on it was, but it was a little sweet, perhaps a white chocolate? I asked about it, but the server didn't know what it was, and promised to go find out for me. He never returned. This was a disappointing dish since it has been a signature little bite of theirs, and given the components, it could have been fantastic. My least favorite dish of the night, but the 4th pick for three others. The velouté was much more successful. It was a hot soup, with a foamy layer on top. It had a really enjoyable foie flavor, not too intense, but enough to really taste it. Just really well balanced. It reminded me of a very similar dish we had at La Folie, except that I really didn't care for the La Folie version, as it was just too rich. My 6th pick of the night, 3rd for two others, and 4th for another. This came paired with a glass of champagne, Serge Mathieu Cuvée Select, France, NV. It was slightly sweet, with some apple flavors. A good drink to start the meal. Next up came the bread service. It was pretty much identical to our last visit, and I felt exactly the same way about it. The bread is from Firebrand. Served hot and toasted, but again, I thought it was too oily. I really don't understand why they put so much oil on, particularly when you are about to spread cheese and honey on it. It was also over toasted, too crunchy and hard to eat, almost cutting your mouth when you bit into it. And, of course, it was my least favorite type of bread: sourdough. But, it came with a pot of ricotta, mascarpone, and honey to spread on. Just like last time, I absolutely loved this stuff. Creamy and delicious. Nicely sweet from the honey. The honey and mascarpone go together so well. I ate the bread that I didn't like just so I could devour as much of this as possible. And when the bread ran out, I actually just finished my pot of cheese by the knifeful. Seriously delicious stuff. Shaved black truffle and mache salad, duck cracklings, hazelnuts: before. Next we moved on to a salad course. It was presented without the foie gras on top, and then the servers came around with the foie and shaved it on top. I liked the fun and interactive aspect of shaving it tableside. Salad: now with (a very little amount) of shaved cured foie! The mache was fresh, crisp, bitter. It was lightly dressed with what the server described as truffle, foie, and hazelnut oil. We have one diner who absolutely hates truffle oil, and we had inquired before ordering if anything had truffle oil in it. We were assured that the chef doesn't use truffle oil, ever, and that all truffle included would be real black truffles. We asked the person who presented the dish however, and he said it was truffle oil. Puzzling. And the truffle oil hater took one bite of this salad and declared that he tasted truffle oil. We asked our server about it again, and he insisted that there was none. I honestly have no idea who to believe, but it is pretty puzzling that the person who served us the dish said there was truffle oil, but our main server said there wasn't. Someone wasn't correct! Anyway. The real issue with this dish was the tiny amount of foie. It was utterly lost in the dish. I obviously could see it and knew they shaved it on top, but there was so little of it, and the greens were so bitter, that I did not taste it at all. Really disappointing, I don't know why they were so stingy, particularly compared to other similar dishes I've had elsewhere. There were also some tart apple batons, which I'm sure would have paired nicely with the foie, had we been able to taste any of it. The menu also said there were duck cracklings, which none of us tasted or saw. Even looking at the photos now, I do not see them. We asked about this, and were later presented with a tiny bowl of them to try. They were crispy little bits, reminding me somewhat of bacon bits. I think they would have added a nice crunch and salt to the dish. This wasn't the first mache salad with shaved foie that we'd seen recently, the previous version being at The Village Pub's Farewell to Foie dinner. The Village Pub's version was more successful, largely due to the far more generous amount of foie, and the frisee to balance out the bitter mache. The presentation on this also left something to be desired. It looked like a pretty measly portion, and was kinda just thrown on the plate. None of us liked this dish, my 8th pick of the night, Emil's 6th, another's 7th, and another's 9th. Paired with Domaine Pichot le peu de la Moriette Vouvray, Liore, France, 2011. It was sweet, yet slightly bitter. I didn't really like it. Jordan almond crusted foie gras, peppercress, orange marmalade, brioche. I was expecting a cold preparation next, so I was pleasantly surprised to see a seared chunk of foie instead. And of course, it was seared a la plancha! This was the current preparation on the regular menu. The foie was ok, with a mediocre sear on it, but really suffered from not being hot. Sigh, why do we keep getting cold seared foie gras? Foie is just something that gets so much less tasty as it gets cold. I wouldn't really call it almond crusted, but there were some slivers of almond on top that added a nice crunch. The salt level in the accompanying sauce was very good. 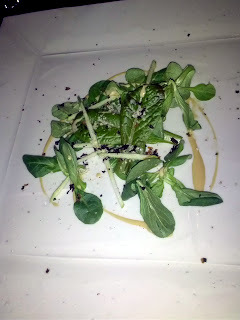 The peppercress puree didn't really have much flavor and was lost. The orange marmalade was a great pairing with the foie, with the perfect level of sweetness and fruitiness that makes for a successful pairing, although it did strike me as being out of season. I'm more used to stone fruits or berries as a pairing these days. The brioche was nicely toasted, but not particularly notable. Also on top was a small piece of duck skin, sorta peking style, that was super crispy. 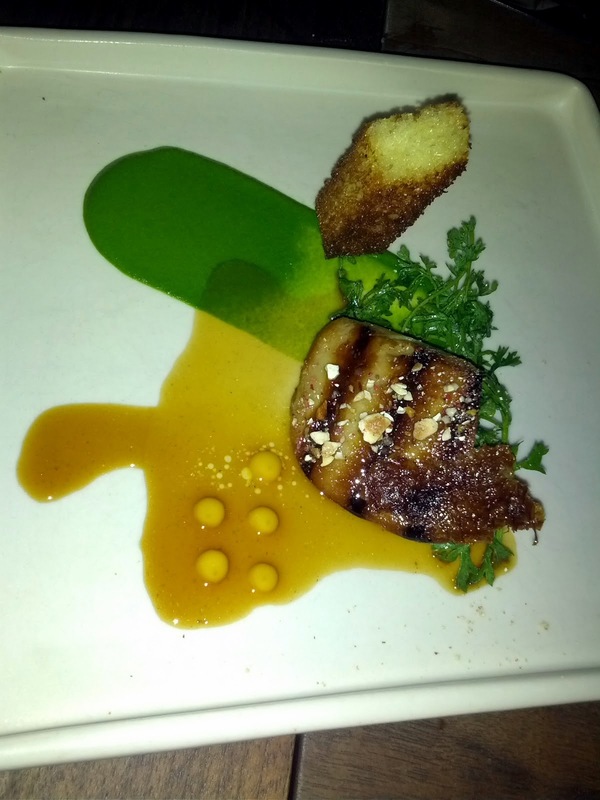 Overall this was a mediocre execution of a seared foie gras. It wasn't bad, but should have been served much warmer, and had no aspect of it to really make it stand out in my memory. They also clearly care about plating, with the two sauces smeared on the plate, and the brioche standing up, but it didn't particularly look nice. Emil's 2nd favorite of the night, but another diner's 6th, and 7th pick for two of us. Paired with Valle Iscarco Kerner 'nectaris', Alto Adige, Italy, 2006. This was a syrupy, sweet, absolutely delicious dessert wine. I loved it. Pan seared diver scallop, foie gras royale, beurre rouge, leek fondue. And now, for a dish I was pretty excited for. Seared scallops with foie! (You may recall from previous posts how much I love a good seared scallop, particularly one with foie anywhere else in the dish!) At my previous visit to Michael Mina, we had ordered the seared scallop with foie dish, and I was expecting something like that, with a chunk of seared foie. Even though we had just had a seared preparation, I was a little disappointed that this one didn't have any seared foie. The scallop had on ok sear, but like usual, I would have preferred it to be more seared. It was also cooked all the way through, and I prefer my scallops to be slightly medium rare on the inside. Interestingly, Emil's was medium rare, so there were some consistency issues here. Unlike last time, it tasted fresh, not fishy, but it didn't really have any sweetness to it that I so often love in scallops. The foie gras appeared in several forms, but the flavor wasn't very strong in either. The first was the foie gras royale, the white substance. I really didn't taste any foie at all, but it was creamy, with a really nice consistency. The second was in the beurre rouge sauce, cutely served in a little pitcher. While it didn't have much foie flavor, it was salty and quite delicious. Being a sauce lover, I may or may not of enjoyed a few spoonfuls of just the sauce. Yum! The leek fondue was the green substance on the plate. 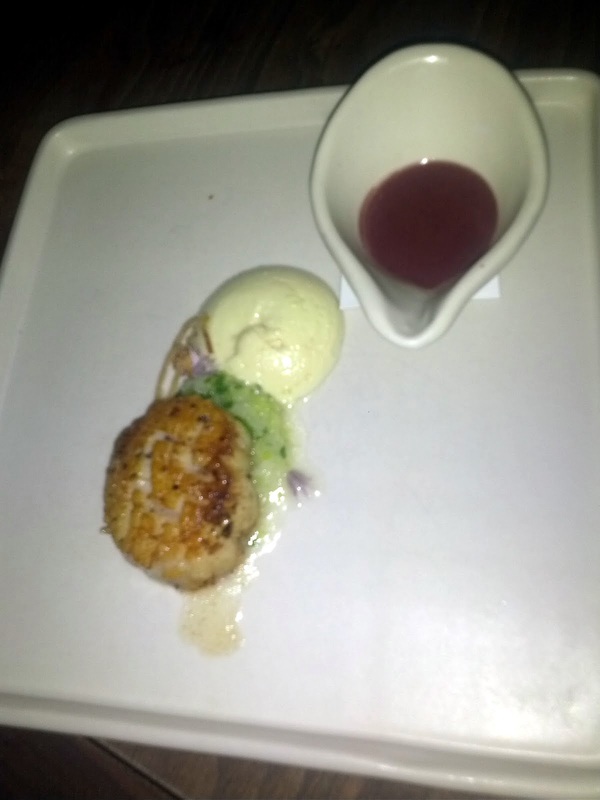 It had a very strong leek flavor, and added a lightness and freshness which paired nicely with the scallop. We weren't really sure why it was called a fondue however, as it didn't seem to have any cheese in it. Finally, there was a tiny, ridiculously flavorful chive blossom and a few delicious crispy shallot rings. I'm not sure you can go wrong with crispy shallots, they seem to make just about everything better. Overall, this was a decent dish, but I preferred the similar one we had at Txoko on their foie gras tasting menu, as the scallop was better prepared. My 4th pick for the night, Emil's 3rd, another diner's 1st, but the other's 9th. Paired with a rose, Clos Cibonne Tibouren, Cotes de Provence, France, 2010. This was very dry and not too sweet. Michael's 'Mac & Cheese', foie gras mousse, duck confit, walnut gremolata. This is the dish I was really, really excited about. Who doesn't love mac and cheese? And even better, this was made with my favorite cheese: comte! And I always love foie gras mousses. Emil had had a previous version of this dish before, and raved about it. I was so excited. The mac and cheese, as indicated by the quotes, was a play on mac and cheese. I think I was expecting a more classic, creamy mac and cheese, with some chunks of foie, topped with a frothy foie mousse or something. There were no elbow noodles here, but rather three pasta tubes, filled with the foie gras mousse and duck confit. The pasta was perfectly cooked al dente. The filling was a little strong tasting for me, I think from the duck confit. The pasta reminded me a little of the squab and foie stuff pasta we had a Fifth Floor a few days prior. On top of the pasta was a comte mornay sauce. It was not creamy, nor really very cheesy, and was fairly congealed, as if it had been sitting for a while. But it did taste like comte, so I liked it. There was also a slice of duck prosciutto on top, that was very ducky, and I did not like. I did appreciate that they were working in all of these extra duck preparations however, like the skin in the seared dish, and the cracklings in the salad. There was also the walnut gremolata, which didn't have much flavor. This dish was very visually unappealing, even though it was dressed up with some leaves. My 5th pick for the night, Emil's and one other's 8th, but the other's 1st. While this fell kinda short, I can imagine this dish being awesome, and kinda drool thinking about a foie mousse stuffed pasta in comte sauce. Paired with Domaine de Montille Bourgogne Rouge, Burgundy, France, 2009. This was a 100% pinot noir, that was really, really good. Complex, smooth, with a good bitterness. 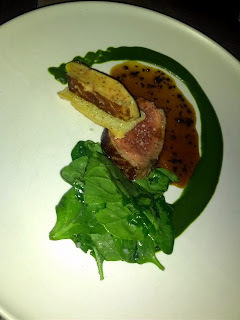 NY strip steak and foie gras 'rossini', brown butter spinach, focaccia, sauce perigourdine. And finally, the main dish. 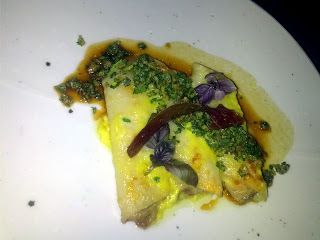 This is the dish I was actually least excited about, but ended up liking the most of the savory dishes. The perigourdine sauce was poured on tableside, another nice presentation touch. This one really did seem to just be real black truffle and not truffle oil. The steak was tender, with a nice sear on the outside, and a perfect medium rare doneness. Well executed. The steak was topped with a grilled focaccia chunk. It was very buttery and crispy. Next was a chunk of seared foie. This one was much better executed than the earlier seared dish, with a far nicer crust on it. It was creamy, flavorful, and really well done. I wish the earlier seared foie had been this successful! They clearly did have quality product and the skill level to do this well, it makes me wonder why the dish that focused on the seared foie didn't come out stronger. Like any rossini, the foie and steak were an excellent combination. On the side were two preparations of spinach. 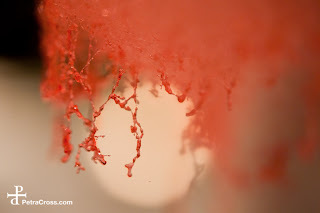 First, a puree, that unlike the peppercress puree, was actually loaded with flavor. Again, this showed that they have the skill to do flavorful purees, so it is unfortunate that the other one fell flat. The other was a wilted brown butter spinach. I loved this. The spinach had tons of flavor itself, and the brown butter it was drenched in was absolutely delicious. Emil didn't care of this at all for some reason, and I gladly gobbled up his order too. This was the most successful dish for our group. It was my favorite savory dish of the evening, making it my 3rd pick overall, the 2nd choice of two others, and Emil's first. Paired with Pecina Crianza Tempranillo, Rioja, Spain, 2005. This was another very complex red wine, that I really enjoyed. Intermezzo: bing cherry, hibiscus gel foam, tarragon meringue, vanilla chiffon cake. This was similar to the intermezzo we had at Michael Mina before, in that it featured a creamy substance, a cake, a foam, and a crunchy bit. The cherry was sautéed in tawny port and caramel, making it sweet and boozy, and quite delicious. The tarragon meringue added a crunch and had a surprisingly strong tarragon flavor. The cake was moist and ok. I didn't really like this, but there wasn't anything wrong with it. Both my and Emil's 9th pick of the night, last pick for one other, and 6th pick for the other. Caramel foie gras ice cream, roasted apricots, vanilla brioche, honey gelee. Being a dessert-o-holic, we had reached the point of the night I always look most forward to. Dessert! I really blame my parents for this one, as it was inconceivable in my household growing up that you wouldn't have a huge dessert after dinner, and we always had an epic amount of desserts to choose from, usually homemade. So even after 7 courses, no matter how full I am, I'm always ready for dessert next. Luckily for me, on our previous trip to Michael Mina the desserts were the strong point, and they were again this time as well. We've had a lot of foie gras desserts lately since we've been doing so many foie tasting menus, and they always conclude with a foie based dessert. Some have been very successful, but most have been kinda weird, so I never know what to expect. Ice cream seems to be a popular pick, and our previous two foie dinners ended with it: Fifth Floor's amazing foie ice cream with fried rhubarb pie and Txoko's foie ice cream with prunes and cookie crumble. 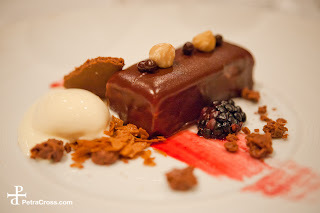 This was my second favorite foie dessert ever, after the foie ice cream and fried rhubarb pie the first time we had it. The ice cream was very sweet from the caramel, but also had a strong foie flavor. It was creamy and quite tasty. Under the ice cream was a grilled slice of brioche, with a subtle vanilla flavor, that worked really well to soak up the ice cream as it melted, and reminded me of a classic cake and ice cream pairing. 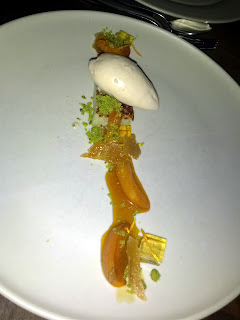 The apricots were very sweet, soft but not too mushy from being roasted, and a good, seasonal, pairing. There were a few sweet honey gelee cubes with a nice honey flavor, not just sugary sweet. There was also some pistachio crumble that I didn't really taste, which is good, as I don't particularly care for pistachio, and some caramel toffee that added even more sweetness and a nice crunch. Overall, this was a very sweet dessert, but I really enjoyed it, particularly with my bitter coffee. My favorite dish of the evening, but Emil's least favorite. You may recall that he does not like sweets at all, and this one was pretty over the top. 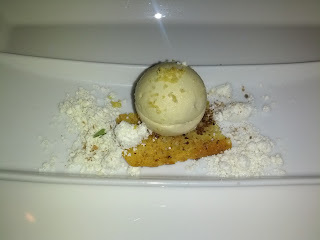 He had hope in liking this though, as he ranked the foie ice cream dessert at Fifth Floor his favorite dish that night! This was the 5th pick for two others. Paired with a muscat, Jorge Ordonez Muscatel #1, Malaga, Spain, 2008. It was sweet, syrupy, delicious. Unfortunately, I split my glass after taking only one sip, and no offer was made to replenish it. The staff were quick to see my spill and come clean up, but I expected someone to ask if I wanted a refill (I would have gladly paid for it). Not pictured is my decaf coffee. Like last time, it was a very good decaf, served in a sleeve to keep it warm, and with a pitcher of perfectly steamed milk on the side. One of the best coffee services I've had. Since I didn't want four cups of decaf myself, I offered some to a fellow diner. He asked for a cup from one server, which never arrived. He then asked someone else, who did promptly bring him a cup. We'd seen this before on our last visit to Michael Mina. No foie in this one, but it was still delicious. Creamy milk chocolate ganache inside, crispy shell, chocolate dust. Lots of good chocolate flavor. My second favorite of the night, Emil's 7th, another diner's 8th, and another's last. Friday night and we were approaching the final two days of being able to get some foie. Since we'd just had two 7 course foie dinners the previous nights, and were planning 9 courses the next night, we decided to take it easy and just get a seared and a chilled preparation. We went to Parallel 37, since we'd heard great things about their seared. And then had our hearts broken when they only had a chilled version available. We got it, but left disappointed and saddened. The only solution was to head to a spot we knew always does a great seared foie gras: Alexander's Steakhouse. We felt slightly ridiculous since we'd be going the next night for 9 courses, but ... sometimes you gotta do what you gotta do! We also hadn't ever tried their latest seared preparation, but I knew it came with peaches and marshmallows, which sounded downright fantastic! We walked in, and the hostess immediately joked "uh, you are a day early!" The place was bustling, insanely busy. We sat at the bar, and watched the bartenders fly back and forth like blurs. I don't think they ever stopped moving for even an instant. The staff there always impress me with the level of intensity they possess. Moving nonstop, always focused, all night long. This is part of what makes the place so great! Anyway, I've reviewed Alexander's so many times now that I even have a tag for it on my blog. I won't go into any additional details here, other than describe our dishes. Needlesstosay, Alexander's saved the day, and we ended our night happily, having now consumed a chilled foie, a foie mousse, and a seared foie! 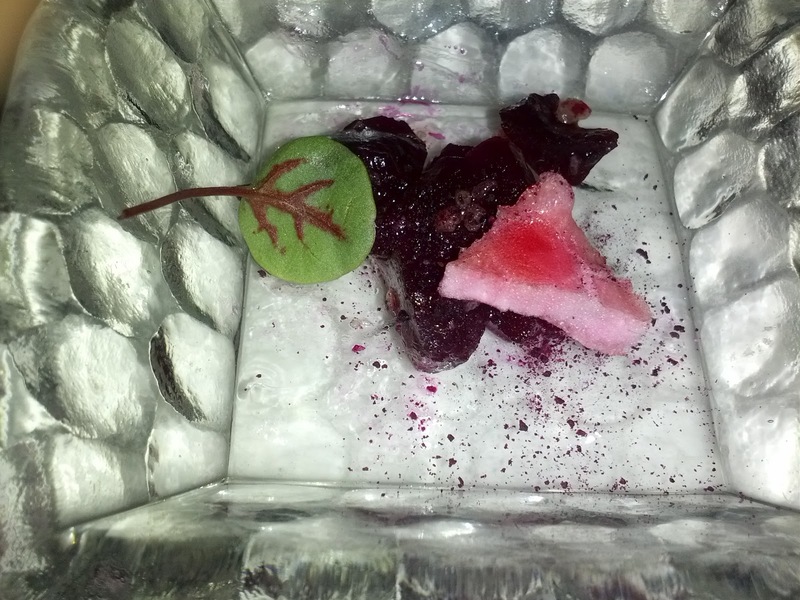 Amuse: broken beets, fizzy campari, sorrel. Even though we had only ordered the seared foie gras, we were presented with an amuse bouche. However, it was ... WATERMELON. Danger! Danger! I have a severe allergy to watermelon. As in, use the same knife and cutting board on watermelon and something I eat and I'll go into anaphylaxis. I immediately sent it away, and was shocked by how quickly a replacement amuse was brought out. We didn't expect an amuse in the first place, and I certainly didn't expect a replacement! Such fantastic service. This was a tiny little bite of a dish on the regular menu, the broken beet salad. The fun part of this was the fizzy campari. Basically, pop rocks. How many times have you eaten beets and had things bursting in your mouth simultaneously? A playful start to the meal. Special gift: foie mousse, maple syrup powder, french toast brioche. A few days ago, the chef tweeted a photo of a version of this, a custom dish he made for someone. It was basically this dish, but with cherries. I thought it sounded amazing. I've long been a fan of the foie mousses that they do at Alexander's, and the sound of french toast and maple syrup seriously appealed to the sweet-tooth in me. I was beyond delighted to receive this extra bite! The powder was intensely maple flavored. I loved it. I grew up in a household that ate a lot of maple syrup since my godfather makes his own, so this really hit the spot for me. The sweetness was of course delicious with the foie. The mousse was cold and creamy, but didn't have as much foie flavor as previous mousses I've enjoyed at Alexander's. I'd have preferred less cream and more foie. The french toast brioche was a thin crispy cracker. Combined with some of the maple syrup powder, it truly did remind me of french toast. The dish was spiced with cinnamon and nutmeg, which went perfectly with the maple flavors, and added to the breakfasty feel of it. I had a hard time figuring out how exactly to eat this dish. My large fork seemed too big and cumbersome. I also tried to spread a little of the mousse on the brioche, but the brioche was too crumbly and broke immediately when I tried to spread the mousse on it. This was tasty and creative, and I really enjoyed a bite with all of the components together, but I think it would have been downright mind blowing if the french toast brioche was transformed into a more substantial component, and served warm, similar to the amazing foie gras and waffles from Spruce. Imagine the mousse melting into hot french toast like butter, combined with the maple syrup powder ... OMG. I want that for breakfast tomorrow! (I'm not joking. If they were open for breakfast or brunch, I'd totally get this). Seared foie gras, toasted peach marshmallow, bourbon baked graham, ume boshi. $29. And finally, some seared foie gras! I'd also seen photos of this before. Alexander's has always done my favorite seared foie gras. And I love marshmallows. And what is even better than just marshmallows? Toasted marshmallows, reminding me of fluffy meringue! And what is my favorite fruit season? Stone fruit season! This dish had my name written all over it. I had to try it! The foie was pretty much exactly what I've come to expect from Alexander's. Creamy, flavorful, quality product. Emil thought it was seared perfectly and declared this in the top 5 seared preparations he has had this year. I would have preferred it to be more seared however, with a better crust. I'm starting to think this is just my personal preference though. Emil agreed that more sear would be nice if being served on a steak or burger, or even with some brioche, but stressed that in this sort of preparation, more sear would overshadow the delicate flavors. That does make sense to me, and I do see his point. Hmmm. The toasted peach marshmallows were as awesome as I'd hoped. Sweet, with a great peach flavor, lightly toasted on top. They could have easily gone on any number of desserts, and I loved them on their own, but they also paired perfectly with the foie. Sweetness and fruit are often paired with foie, but this was a really creative way to do it. I loved the texture from the creamy marshmallow rather then crispier fruit slices as well. There were also some dabs of assorted stone fruit purees, which injected some intense flavor and complimentary sweetness. The ume boshi upped the complexity by adding a tartness as well. The one thing I didn't care for was the bourbon baked graham crumble. It was bit too bitter.